As you have probably noticed, I like to review food! I especially love to review sweets as I know my hubby really loves them (as do I, but try to limit my consumption of them...lol!). Recently, I was contacted by Dancing Deer Baking Co. asking me if I would like to do a review for them. LIKE to do a review???? YES!!!!! I told them that I would LOVE to do a review! Can you sense the excitement here?!? Dancing Deer Baking Co. has been providing gourmet gifts since 1994. Founded in Boston, Massachusetts~Dancing Deer Baking Co. is among the most admired brands in the gourmet natural and specialty gifts marketplace...and I don't have to guess why! Their products are WONDERFUL...and dangerously delicious too (so proceed with caution...or reckless fury!!)!! Driving with Passion We are a company of people who are passionate about food, nature and aesthetics. We are dedicated to excellence in all we do! Pleasing the Eye and the Palate Our products are known for straight-up yummy-ness, innovation, artful but simple packaging and pure, high quality ingredients. We blend traditional artisan baking with innovative flavor combinations and package our products with a somewhat whimsical disregard for the expected. We think packaging should be as artful, honest and as good as the food. Using All-natural Ingredients We choose to make a perishable product without artificial preservatives or other ingredients because we believe in the principles of purity and freshness in food. Our products are always all-natural, baked from scratch and Kosher. Caring for the Environment To the extent possible we make choices in our packaging, production and facilities management, which are friendly to the environment. Enjoying our Work We strive to achieve both financial and market success, while achieving personal and professional rewards for all "deers". There's more to life than selling cookies - but it's not a bad way to make a living. To me, one of the most admirable qualities of this company is their attention to detail. When I received my package it was sooo gorgeous! The ribbon was tied just so and looked perfect...betther than I could have done, that's for sure!!! Dancing Deer Baking Co. has a whole plethora of products to offer for any occassion! 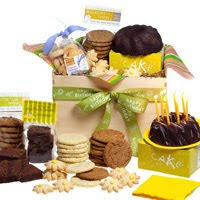 They offer everything from Breakfast Gift Baskets, to lucious cakes, to gift towers. And like I said before, the packaging is so gorgeous...anyone would love to receive a Dancing Deer Baking Co. product as a gift! 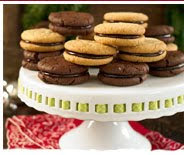 "Each recipient will receive a gift box full of over two dozen different cookies. Every month, each Cookie of the Month Club recipeint will get one chewy cookie sampler along with a variety of shortbread cookies. 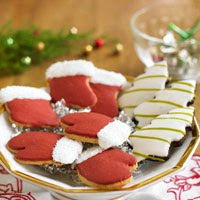 Send cookies to children at school or to loyal customers to enjoy throughout the year. Sign up for a Cookie of the Month Club subscription today!" That's a really neat program that they offer. Visit Dancing Deer Baking Co. and tell me something that you would love to try. You do not have to be a blogger to enter, but you must leave a valid email where you can be reached should you win. Leave your email in EACH COMMENT. This giveaway is open to US residents and will end 11/30 at 11:59 pm EST. The winners will be chosen using random.org and will be notified by email. The winners will have 48 hours to respond. 4. Do a post on your blog and/or Facebook regarding this giveaway. Leave a comment with a link. 2 entries, so 2 comments. Disclaimer: I received no monetary compensation for this post. I did receive a dozen Gourmet Sandwich Cookies for review purposes. All quotes are from the Dancing Deer Baking Co. website, email and/or catalog. All thoughts and opinions are mine. I forgot to post my mandatory entry! I want to try one of the frosted cookies. Mmm. You had me at cookies!! The chocolate expresso cake looks yummo!! Haven't had the maple, oatmeal raisin yet. Oatmeal cookies are my favorite. I follow via GFC! Thank you for the giveaway! New Follower, Follower on Twitter. 4 entries. :) Thanks for the giveaway! I would like to try the sandwich cookie or the brownie sampler (for my husband of course). *drool* I'd love to try the chocolate tangerine cookies! I think the chocolate tangerine cookies sound yummy! I'd like to try the chocolate expresso cake. Yum yum! I would like to try the santas sleigh ride collection! I would also love to try the Home Sweet Medley! I lovin' the idea of a chocolate espresso cake!